Bodyswerve 8c, and new shoes! Ha ha did you catch the 60 footers on the TV news? If you missed it then you can stream the report from the BBC site here. 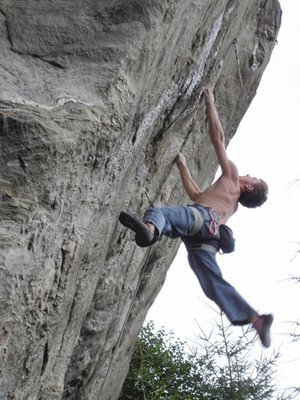 Mick put up another review of E11 on UK climbing, leading off with my scary grimace on the fingerboard. As Mick says about my climbing "someone who was so crap shouldnt be so good". So I do have to battle hard, both on the fingerboard and on projects to have half a chance of getting up a route like Rhapsody and that seems to have rung loud and clear on the film. Big well done to the Hot Aches guys. Its a big weekend for them and wow what a progression theyve had in a short time to scarily professional. It certainly will be a strange one for us at the Edinburgh Mountain Film fest tomorrow with 500 odd other folk watching the results of our labours. By the way the DVD stock is ready to ship now and I'll be giving the post office a big sack of all my pre-orders tomorrow morning. If you want to get hold of a copy of it then you can from the webshop and I'm shipping them straight away now. It's been another week with the pedal on the floor. 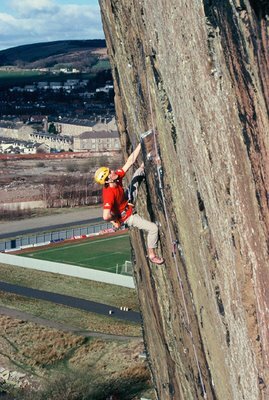 Not climbing - a crazy mix of extreme DIY in the flat and work for the E11 film and the Edinburgh Mountain Film Festival. 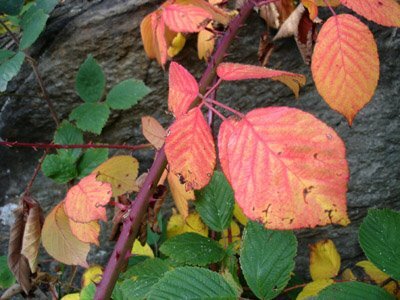 I've spent so little time outdoors so I'm really missing the feeling of the season changing and winter slowly approaching. Maybe thats not so bad since winter is maybe not approaching at all judging by the hot evening sunshine at Salisbury crags last night. 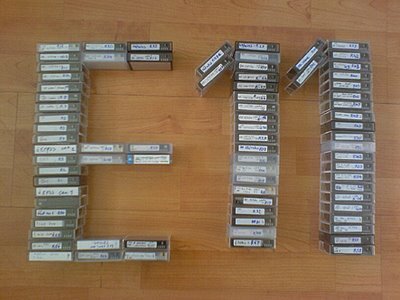 Although I've not had time to catch my breath I'm still looking forward to the showing of E11 at the EMFF on saturday night. I hear this morning there are less than 50 tickets left so if you want to go you should get hold of one. I've just had one of those bizarre experiences - talking to TV reporters at the Dumbarton Rock about the film. I don't think I will ever get my head round the interest its caused. Scottish readers should hopefully catch my mumblings about it on Friday's BBC Reporting Scotland! 8a.nu seemed to like the film as well. It always amazes me at these times of extreme busyness how resilient the human body is to lack of sleep and good food. I repeated my PB on the fingerboard last night, but then realised that I had forgotten to take off my weight belt from a previous exercise!! Maybe I was dehydrated or something? Actually I think you get a bit of an endorphin thing going on when you go into workaholic mode. Its just about a week now until the film comes out. Thanks to everyone who's already pre-ordered it from me. If you want to order it I hope you will from my shop! I'm looking forward to seeing everyone at the Edinburgh Mountain Film Festival next weekend. At my last count there were a couple of spaces left on our coaching sessions on Sat and Sun and I see this morning that there are still some tickets for the showing of E11 and Tim Emmett's lecture on the Saturday night. Hot Aches have produced an ad for Scarpa with footage of me doing Bodyswerve at the Anvil. You can see it here. I've been getting more and more into gear testing work for my sponsors and getting involved in design - its pretty good fun. I guess I have the good job out of the whole process in that I get to go climbing and then come back with ideas for how to make the kit help you get up even harder routes. I pass my knowledge on to the rest of the team and some time later, hey presto! you see your ideas turn into products. It's easy to take for granted the work that goes on in between. Anyhow, here are some more shots from the Anvil from Tuesday. The one of me on Bodyswerve is by Hot Aches. Tom Charles Edwards enjoying the transition part of Spitfire 8a (transition from 'crimpy-balancy' to 'just plain burly' on the second half). The arete to the left is Anvilfire which is 7c+. to the right are two brick projects, and then some more amenable things... There is a full guide for the place here. Diff starting Amateur Hacker 6b. 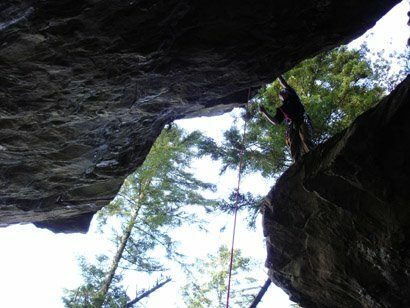 Great rock architecture on a 6b! Diff adding yet another hi tech repair to his Duvet. Good as new?! Things have been steadily coming together on my second roof project in the Anvil's massive cave. This one is the left hand exit to what Alan anc Robin called "project McF**K" after they had a look at it. Its about 8a up to a decent edge, then hard moves one after the other all the way to the ledge. A superb new foot sequence was the final straw that got me through those last few moves, although I broke a couple of PBs on the fingerboard the night before and got a bit excited that it could go the next day. After one failure, going flying sideways after a violent slip on the last move, next time I hit the jug and screamed! 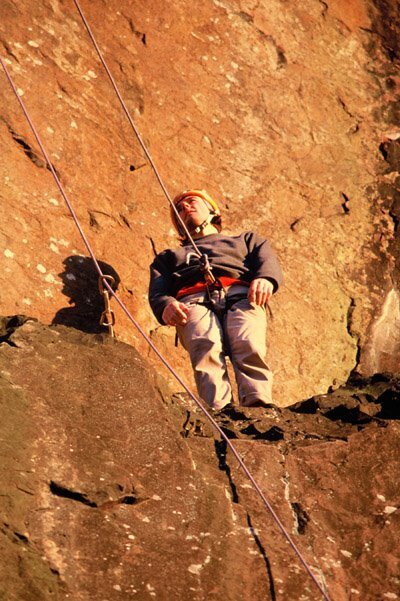 I reckon it's about 8c and I'm certain its the hardest sport route in Scotland now. I've put up some more pics of it in my gallery here. 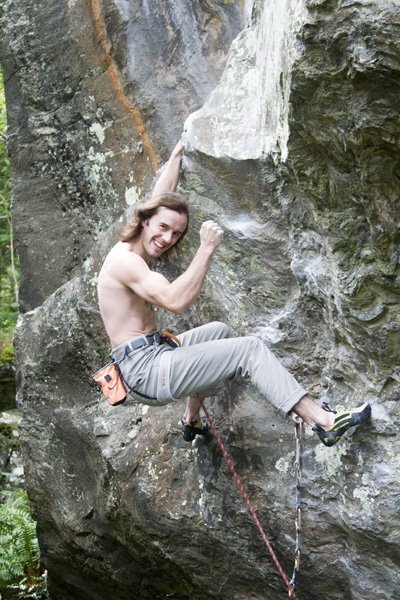 I think Hot Aches video of it should be making an appearance on UK climbing sometime shortly. I'll let you know when I hear its up. Another big development for me this week was a change to wearing some new shoes from Scarpa. 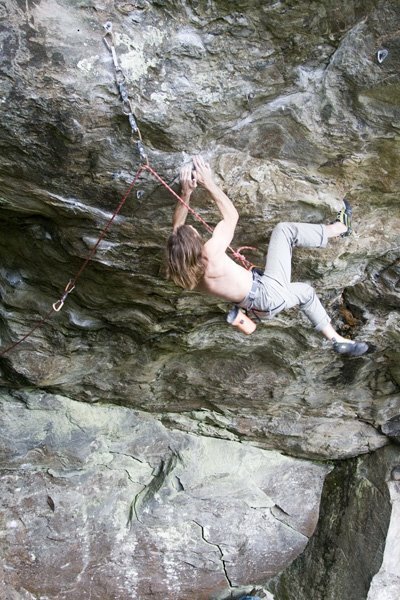 It's obviously extremely important to love your rockshoes as they affect your climbing standard so much. Even more so for me as I'm comparatively weak and need to squeeze every last drop of advantage out of my feet. With Heinz Mariacher designing at Scarpa now their new shoes are somewhat inevitably rather brill, so it was time to move. I've been wearing the same shoes for nearly ten years and it's amazing how used to a certain shape and feel. 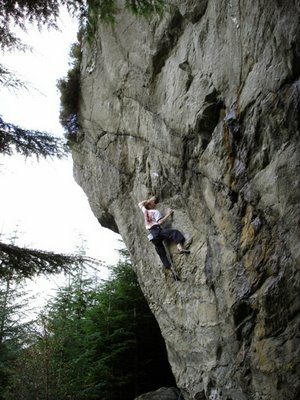 As I'm now starting to realise trying new ones out on my new route, designs have come on a bit in that time! Heason Events have organised a pretty cool event in Sheffield on November 8th - a showing of E11 and Set in Stone. 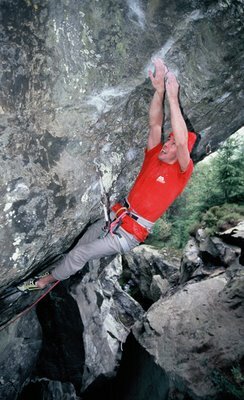 Set in Stone is the new film about Dave Birkett and his living end trad routes in the Lake District. The trailer for this looks amazing, I'm pretty excited to see footage of his routes. Its also great to see a film about Dave as he's been such a prolific climber for so long. Talking of trailers, the interest in the E11 film continues to overwhelm me - 21,000 downloads of the trailer. I only hope folk decide to get the DVD from my site! The film night on Nov 8th is in the Showroom cinema in Paternoster Row and starts at 8.30pm. Tickets are £7/5 and you can get them from the Showroom Cinema box office - 0114 275 7727. I will be there along with the Hotaches boys as will Dave Birkett to talk and answer you guys questions about the films, the routes and climbing in general. We'll bring some copies of the DVDs along too if you want to get a copy. 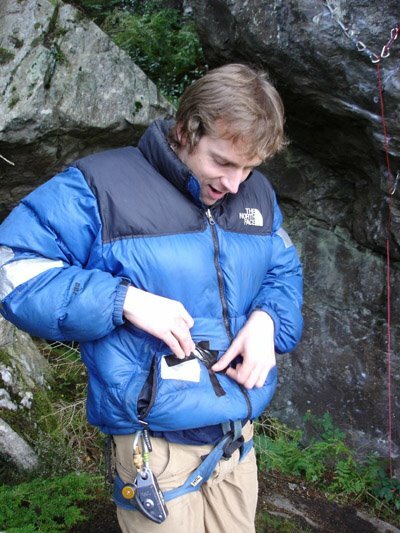 I'm shortly going to be doing an article over on UK climbing about getting the most out of indoor walls now that the sutumn deluge has probably reached all corners of the UK (except my project on the Anvil) and we might be thinking about heading indoors for a stint. Mick Ryan has started a thread on the forums there to gather folks 'frequently asked questions' on the matter. 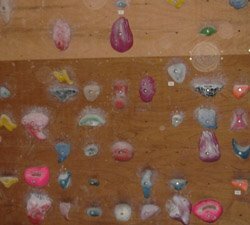 I'll focus my article on the questions that come from this, so if you feel like theres something in particular you always wanted to know about using walls to get better at climbing, go to the thread and log your question here. It's been a mad week of working at different ends of the country but I squeezed in a session with Niall at the Anvil. Lack of sleep mean't the walk-in felt hard enough, but there's something to be said for going on your projects when you are feeling knackered and weak. Your feebleness forces you to think again about the foot sequence and I found a brilliant way to do the crux that misses out all the cutting loose on crap slopey edges. It also misses out a hand move so I've gone down to being 5 moves away from success by the back door! It was good to watch Niall get the 3rd ascent of Spitfire which is back down to 8a after Niall found a good method at the top. There are more pics of this on Tweedley's new blog (which is excellent - looking forward to reading more of this Michael). Other climbing blogs spotted this week included Phil's blog "I must try harder". I've been frantically doing work that might allow more time to climb in the coming winter season, which is pretty cool. 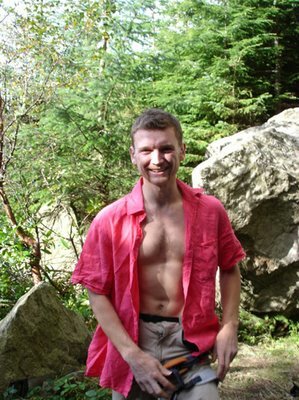 I'll be glad when I can start to train at full tilt again thats for sure, I miss feeling fit.